The heat has finally subsided here in sunny Southern California and I am quickly coming to see why people so enjoy living here. With such beautiful weather awaiting us outside, and so many new people to meet and interesting places to explore, it has been hard for Dustin and I to spend too much time experimenting and developing new recipes for you all. Excitement awaits around every corner, and when adventure beckons, we heed its call. While I have no tasty recipe to share with you today, I have some new favorite discoveries that I want to tell you about. First, from the tech world, this app, called List Bliss, has helped me keep my sanity, making it easy to keep my grocery list up to date and ensuring I wont forget it at home when I go to the market. List Bliss even enables you to keep a running inventory of your pantry so when inspiration strikes at the farmers market, you know what ingredients you have on hand at home and can begin to craft a recipe that incorporates your fresh market find with staples from your pantry. I have fallen head over heels for the simple elegance of Harumi Kurihara’s recipes. 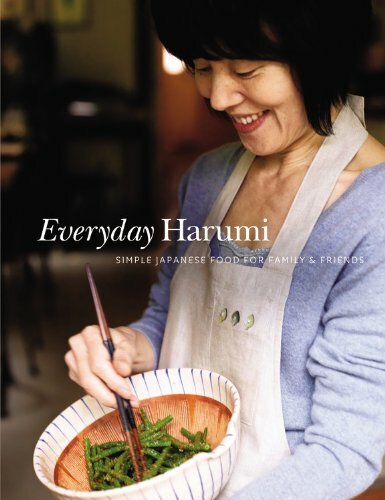 After checking “Everyday Harumi” out from the library I knew I had to add this to my home collection. Harumi’s recipes are built from a simple pantry of basic Japanese ingredients bringing new light and fresh flavors to some of our favorite vegetables such as green beans or pumpkin. Most of the recipes are quick to prepare and Harumi offers the home cook some ideas on how to experiment with the dressings and sauces to put their own personal stamp on the dish. Be on the lookout for our takes on some of her classic dishes in the upcoming weeks. Speaking of cookbooks, have you taken a look at what your public library has to offer lately? I have been sincerely impressed by the wealth of cookbooks available to check out at the libraries in the Pasadena area. The selection varies greatly from library to library so be sure to visit a few to determine which branches have the best offerings. The library has so much to offer beyond cookbooks. From books on organic gardening to scientific journals, new CDs and even classic films on DVD you might be surprised at what you can find. Though some libraries function independently, most libraries belong to a regional organization and will allow you to place a hold on books from any branch in the system. They can even have the books, CDs, or DVDs brought into your local branch from a branch far away. Here in San Gabriel we are surrounded by an almost overwhelming number of Asian restaurants and supermarkets. As I have explored some of the local markets I have been re-discovering some ingredients that had not been as easily accessible in Tennessee. 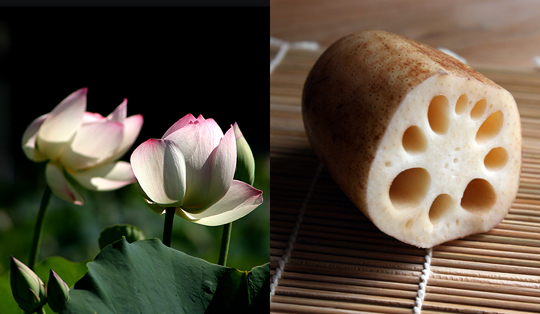 Two ingredients that I am really enjoying experimenting with in our kitchen right now are Seaweed and Lotus Root. If you are lucky enough to live near an asian grocer you will likely be able to find salt packed seaweed in the refrigerated section of the store. 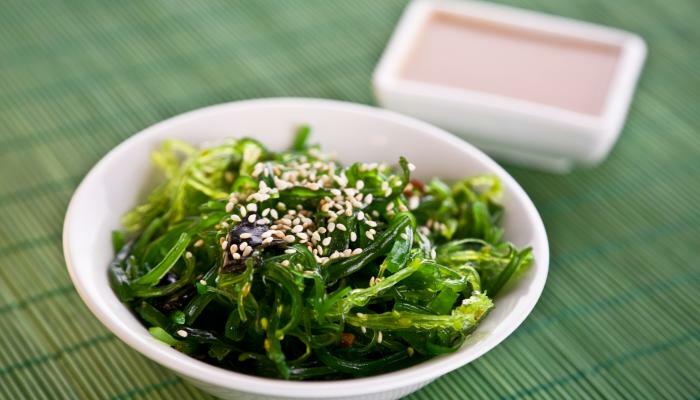 For tips on selecting and cooking with seaweed see this fantastic post from David Tanis that was featured on the Splendid Table. The photograph above is of Tanis’s take on a classic seaweed salad and is from that same article, you can find a link to the recipe here. I came across a lotus root salad at the local farmers market and it brought back memories of the many lotus dishes I enjoyed while living in China. The lotus root is a commonly used ingredient in Chinese cooking and it is thought to have beneficial health properties, specifically for the lungs. In Chinese medicine it is believed that the fall is a time to focus on strengthening the respiratory system, which is particularly susceptible to infection and illness as the changing seasons usher in colder weather. Lotus can be prepared in a variety of ways including stewing, and stir frying but I particularly like it in a salad where its beautiful shape and crunchy texture really shines. When shopping for fresh lotus look for roots that are relatively evenly colored and free of soft spots, also peek down the tubes to check for signs of mold. 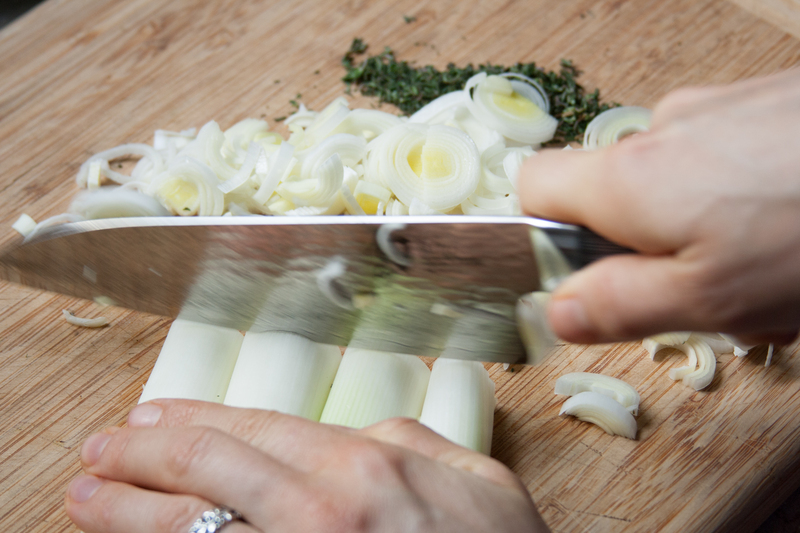 Once at home simply peel the roots and slice them before incorporating them into a stir fry. 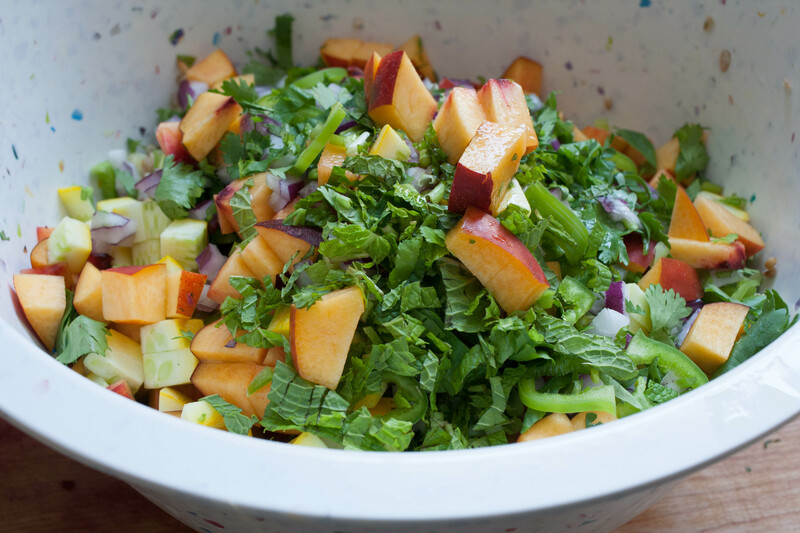 When making a salad, I first place the slices in a bowl, cover the roots with boiling water and let them sit for a few minutes before draining the water and repeating the process. If your roots are harboring a lot of dirt you may need to repeat this several times until the water is no longer murky after soaking. And while we are on the subject, I may as well continue with the theme of inspiration from The East to tell you about one of my new favorite spots to find cool cooking gadgets and ceramics. Daiso Japan recently opened a new store in Temple City, minutes from our house. The store is quite similar to the many american 5&10 or dollar store chains with the major difference being that all of the products come from Japan. Unlike the american dollar stores which are full of goods made overseas for consumption by the American consumer market, the products at Daiso are mostly created for use by the asian market. Because of this, you can find some really unique knick-knacks which range from patterned ceramic plates to jeweled hair accessories, colorful office stationary, and even some super cute plastic gloves to don while doing dishes. While I cannot guarantee that all the products are made with the highest quality materials, the price is right at $1.50 per item and likely worth the gamble on quality. To find out if Daiso has a store near you, you can check out their list of US locations on their website. Finally, for those of you who have recently moved to an new area or are simply looking to try out new activities check out meetup.com. On the site you will find numerous local groups organized around common interests or activities. Ever wanted to try sky-diving? There is probably a meet up for that. Looking to try out new trails? There is likely a group of hikers in your area that organize weekly/monthly hiking events. From book clubs to walking groups there are so many things to try and explore. So check it out for yourself, and if you happen upon some new favorite things of your own, be sure to let me know in the comments below! I believe that I have mentioned this before, but for all of you who are new to reading our blog, it is worth noting that my husband and I typically squeeze and entire week’s worth of home cooking into two far-too-short weekend days. Perhaps because of this, I approach a weekend full of cooking through the lens of a notorious and slightly obsessive planner. Yes, it is quite likely that I spend far too much time during my evenings paging through recipes, perusing blogs and forums, reading online reviews or comments, checking for not-to-be-missed sales, and browsing through pinterest images for new ideas. Often times these searches are shaped by the ingredients included in that week’s CSA haul – search pinterest for “kale” or “garlic scape” and you are quite likely to be entirely overwhelmed by the sheer wealth of recipes and photos that turn up in the query. Occasionally a dish will be planned out to make use of a pantry ingredient that has spent a bit too much time on the cupboard shelf – and I spend my time scanning the glossaries of old cookbooks for “mung bean” or “sticky rice” in hopes of striking upon an inspiring image or intriguing combination of ingredients. By the end of the week, my cooking plan for the weekend has taken shape. I have a peg board where I pin up the weekend’s top candidates, including recipes, photos of plating ideas, designs for canning labels, themes for a new blog post etc. I scan our pantry and cupboard for required ingredients, making sure to note what additions are needed. Come Friday morning, my grocery list is well sketched out, organized by section, and I know well which items will require a trip to a specialty store. But unlike my loving husband, who has laser-like focus when it comes to executing on a well-documented shopping plan, I have a tendency to get a bit distracted at the market. I have a very difficult time not being swayed by a beautiful pile of peak season produce. I guess this should not be surprising to you given that this is, after all, a blog about cooking with in-season fruits and vegetables. Above all, I have a huge soft spot for heirlooms – if it looks a bit different than the average head of cauliflower, or bunch of beets, I cannot resist the urge to take it home and put it to use, looking for any discernible difference between the standard produce variety and whatever local breed I have happened upon. 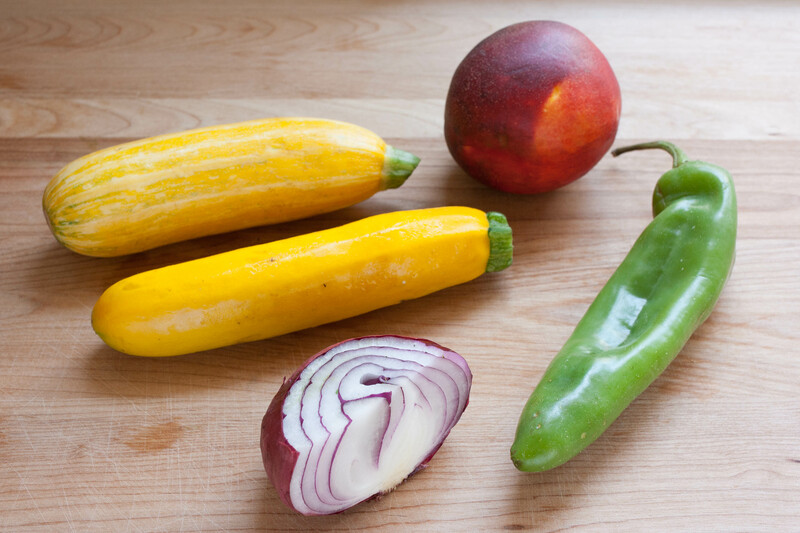 Often times I find that the nuances of a certain type of fruit or even of a variety of veggie at a certain time of year, make the produce better suited to a certain application. Petite early season beets are amazingly tender and their subtle sweetness shines through when simply roasted and served on a salad. Late season beets have a more pronounced earthiness and stand up well to slow roasting on the grill where they pick up a smokey flavor and can then be puréed into a rosy pink beet dip with a bit of dill, yogurt and tahini. The point of all of this is that, cooking from the farmers market requires a bit of flexibility. Even my best laid plans for, say, ratatouille can be foiled by a sudden dearth of eggplant. Or I may find that the peaches I purchased were too tart to be simply sliced and served atop pound cake. But all is not lost, the too tart peaches may be better suited to another application, for example – they might be delicious if marinated and grilled as an accompaniment to pork chops. I recently made it home from Whole Foods with a curiously tall bunch of celery. As it turned out this celery was far more bitter than the typical variety and, as such, I wasn’t too keen on the idea of munching on it raw, and even a thick glob of peanut butter couldn’t cut the bitter undercurrent. I sat for a while and flipped through cook books looking for a recipe that would make use of the bitter celery. 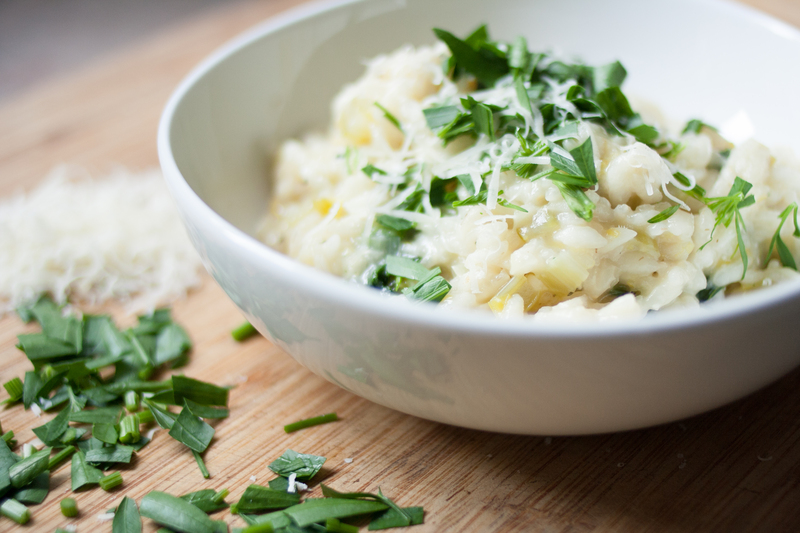 When I happened upon a recipe for a celery and mushroom risotto I was inspired. I suspected that the celery, when sautéed in butter, would take on a softer, nuttier flavor and hoped that the herbaceousness would bring a lightness to the often times heavy dish. Though we did not have mushrooms on hand, they were not missed, but if you are inspired by the idea, feel free to toss some in with the celery as it sautées. 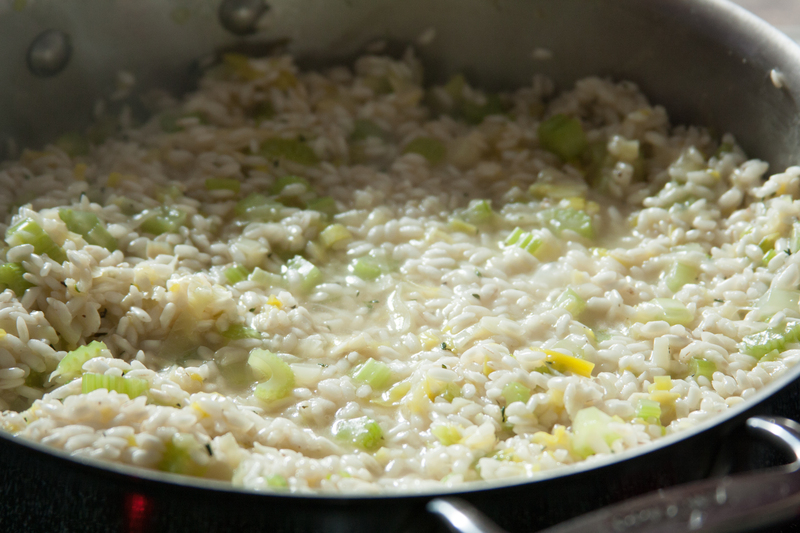 Place the water or stock in a saucepan (pick a saucepan with a well-filling lid.) Put the pan over medium high heat and bring to a boil, once boiling, put the lid on the pan and lower the heat to keep the liquid at a simmer. In a wide sautee pan, heat the butter and olive oil over medium heat. Add the leeks and thyme and sautee until soft. Add the garlic and stir until fragrant. 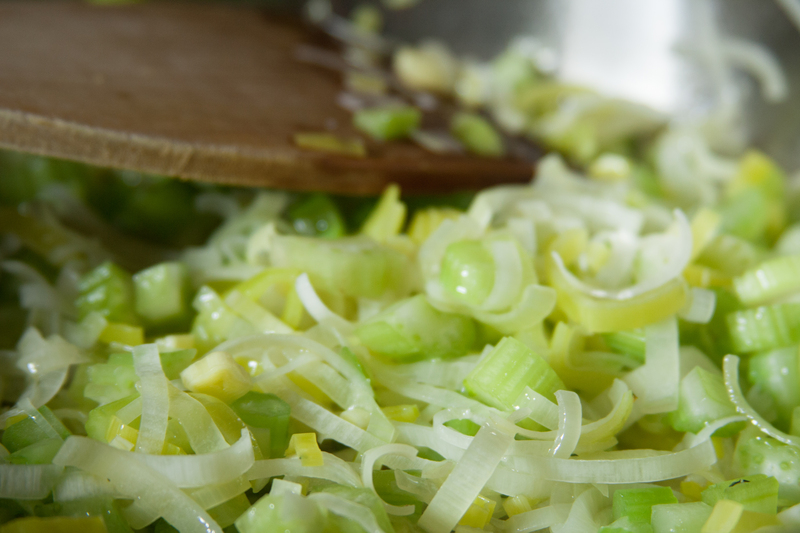 Add the celery to the pan along with a small pinch of salt and sautee until the celery softens, stirring occasionally. 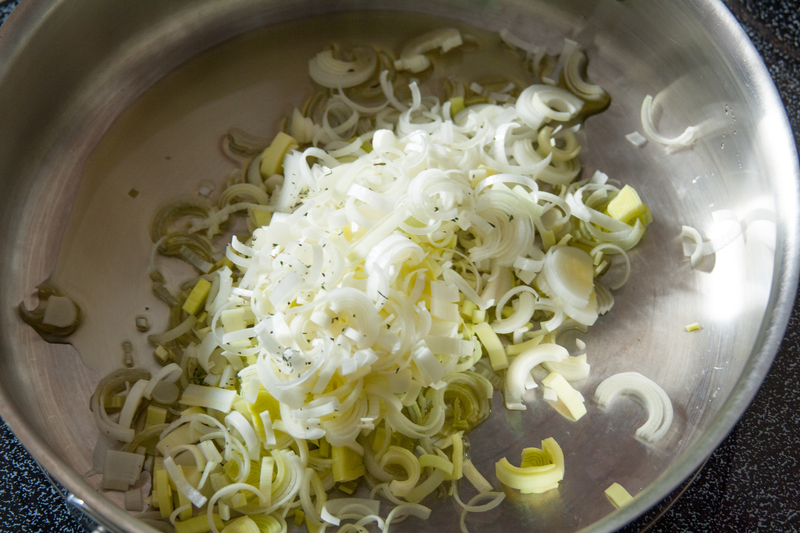 Once the celery is soft add the wine and cook until the liquid has almost completely evaporated. 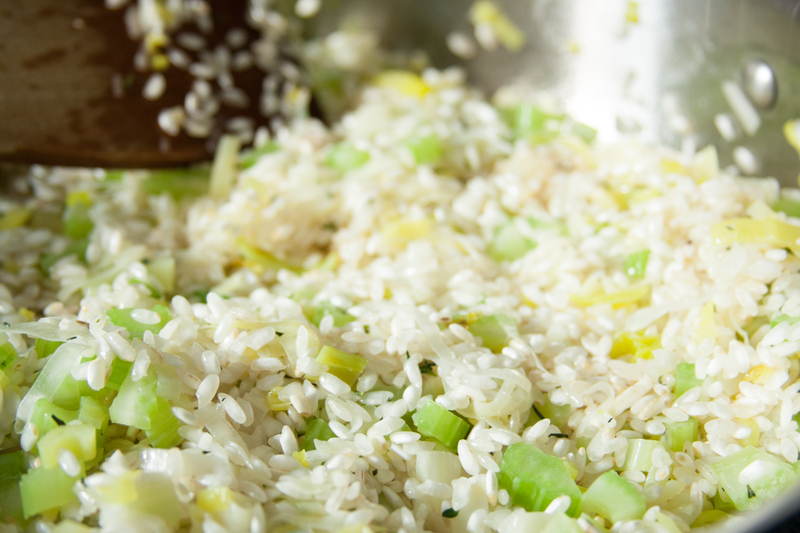 Add the rice along with a ladle of the simmering liquid and stir until the liquid has been absorbed by the rice. Continue adding stock, one ladle-full at a time, until the rice is cooked to your liking (I like mine to still have a firm, but definitely not a crunchy, texture.) Once you have reached a nice texture remove the pan from the heat and add the cheeses. 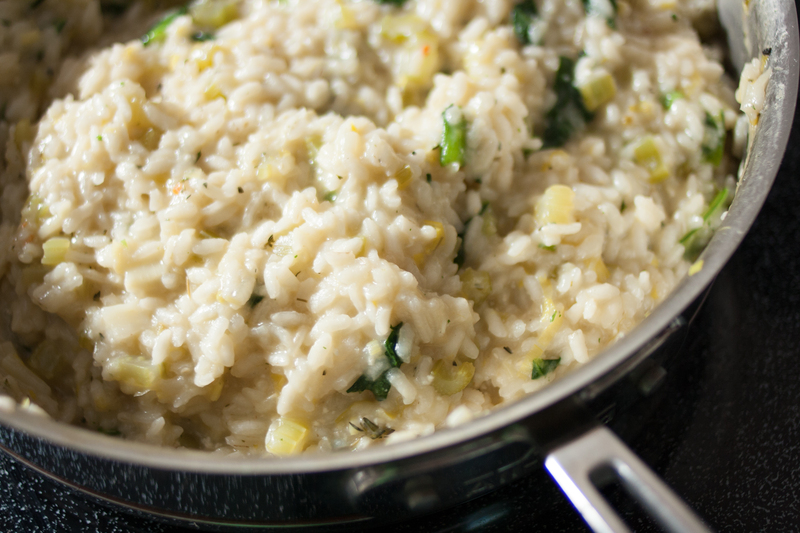 Taste the risotto for seasoning, adding salt and pepper as needed. 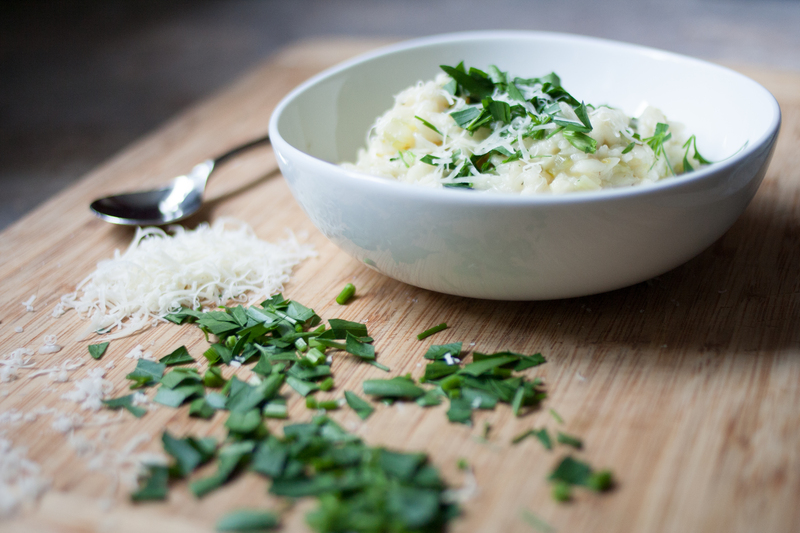 Serve hot topped with parsley and a sprinkling of parmesan cheese. Last week I flew to West Palm Beach for what amounted to a whirlwind tour of four planes, two airports, one vendor hall, and many many faces. From start to finish, my feet only left Nashville soil for 26 hours, but it felt like days. Travel can be hard on the soul. You see, for a “work trip,” there is always so much prepping that needs to be done. Presentations to write, arrangements to make, names to remember, org charts to put to memory, not to mention the doubt and uncertainty that sourrounds your attire – is it the right suit? Is this even a suit event? Are open toed shoes acceptable attire for an evening netowrking event? 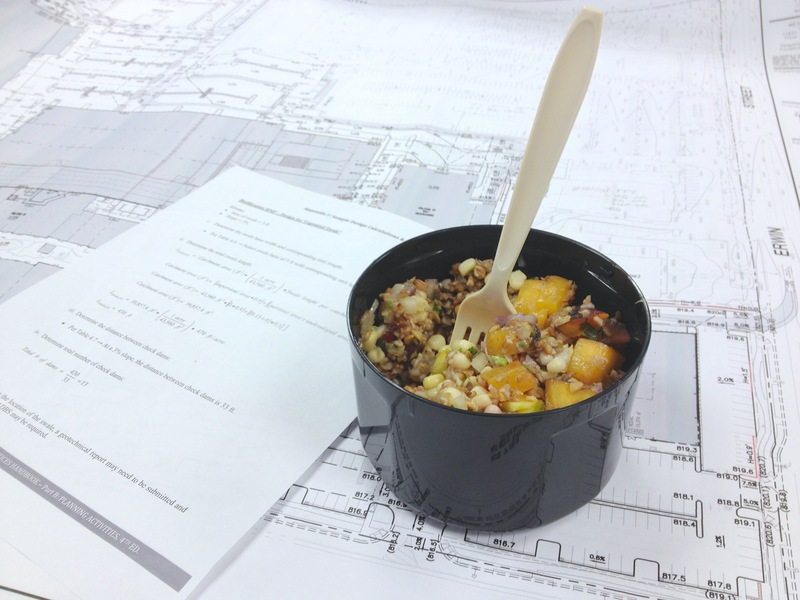 And so on, and so on… And this is to speak nothing of how and where you might find suitable meals on the road. Which is fine, because chances are, if your trips are as harried as mine, you won’t have time to eat. This recipe is a wonder for travelers of all sorts. 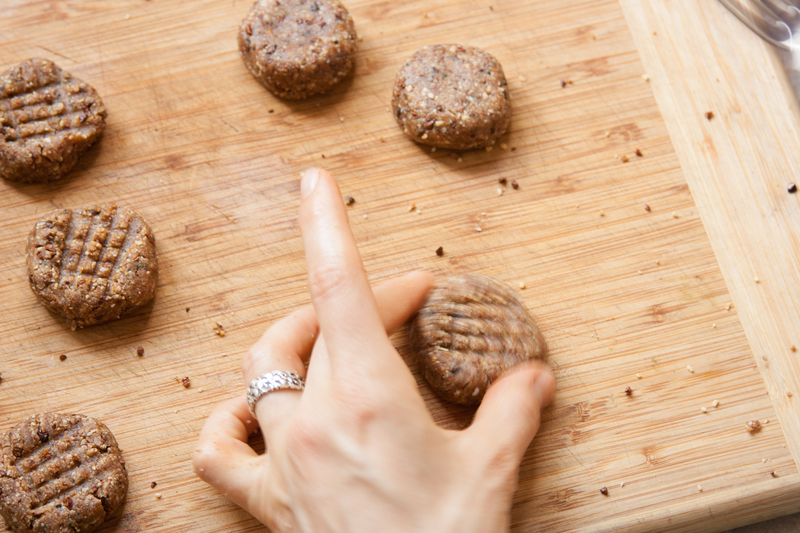 The bites require little prep, few ingredients, and come together in a snap with the aid of a food processor or blender. They are full of healthy fats and protein from the nuts and seeds, antioxidants from the cacao, and are completely free from added sugar. They require no refrigeration, no special packaging, and are even delicious when recovered from the bottom of a weary travel bag – slightly melt-y and a bit smooshed. 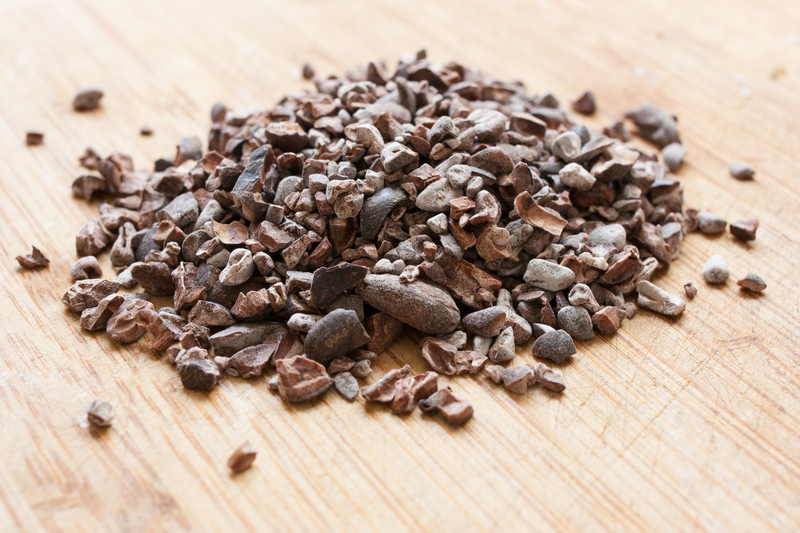 Place the almonds and cacao nibs in the bowl of a food processor or a blender with a pulse function and pulse them until they form a coarse meal. 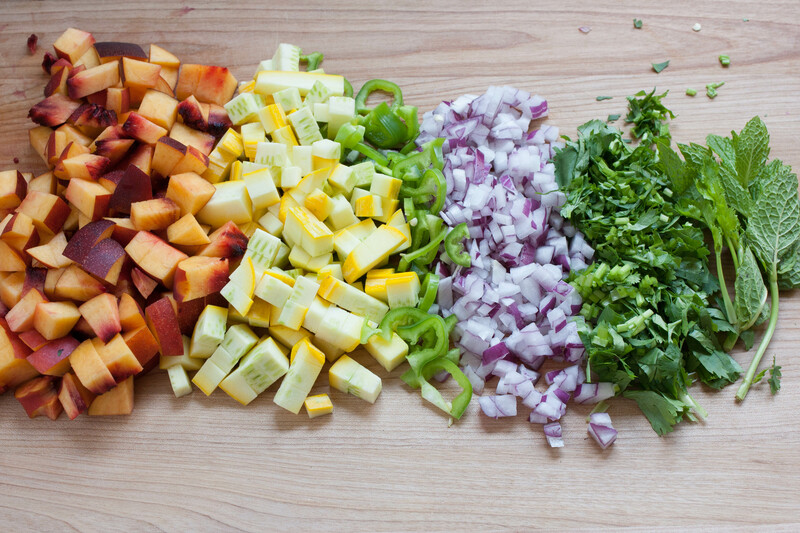 Add the remaining ingredients and continue to pulse until the mixture just comes together. 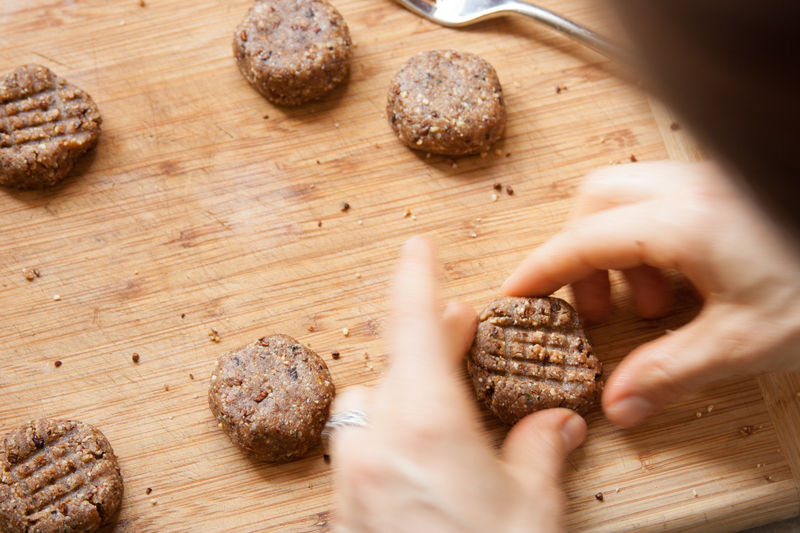 Once you have formed the balls, you can use a fork to stamp a crosshatch pattern on the tops, squishing the mounds as you go to form cookie shaped bites. As soon as you are done shaping the bites they are ready to eat. The dough will firm up slightly if given time to cool in the refrigerator. Allowing them a bit of time to chill will help the bites hold their integrity when they are inevitably tossed into the bottom of a back-pack, hand bag or suitcase. Spring is settling herself in right now, or at least she is trying. Perhaps its the ever controversial global warming giving our girl a rough run, but she seems to be experiencing some crisis of identity as she navigates the gap between the seasons. Like an awkward tweenager she makes her way in fits and starts. One minute she is demure and sun-beaming, makeup painted on with an expert hand – smiling pretty. Seconds later she has run her stockings, throws a fit, mascara streaking down her face as tears the size of nickels come rolling down. Flurries of laughter lightly mask deep seated angst but there is rumbling still beneath the surface. Sure, it looks pretty today, but don’t be fooled by the Polaroid image – it is only a moment in time. Storms are likely a-coming, and knowing our luck, they will arrive just in time for the weekend. With the winds a-changing we are busily reading ourselves for the onslaught of fresh fruits and veggies that comes with the start of the CSA season. I have been scouring the corners of the deep freezer for any remnants of last season’s produce and am doing my very best to clear out any stragglers hiding out in the “root cellar.” Making room for this year’s haul also entails a desperate attempt to make use of my stockpile of “freshly milled” grains from Anson Mills that have been biding their time in the deep freezer. With only a moment or two spent scanning the contents of the waist-high freezer you will find everything from Red Fife Wheat to Perfectly Milled Grits hanging out in organic looking brown satchels. Though I am embarassed to admit it, I have barely begun to make a dent in the wide array of milled products I ordered from Anson in early February. I am all about working with great ingredients, but there is something about working with this amazingly high caliber of goods that is simultaneously exciting and intimidating. For a bit of background on just why I have this amazing respect for what the folks over at Anson Mills have accomplished, the farmers and millers at Anson Mills have toiled for years to recreate heritage milled products grown by Small Farmers (themselves growing grain on about 150 acres) in South Carolina. In reviving centuries old growing and milling practices for grains, Anson Mills brings us back a piece of our food culture past. Many of the products in their repertoire, like their widely renown grits, likely also exist in what I hesitate to even call a weak likeness on a shelf in your local Walmart. But Anson Mills have taken these ingredients, food stuffs which, in other hands, have become ubiquitous, commonplace, and so often thoughtlessly processed and have elevated them to their former glory as cornerstones of New American cuisine. On their site, Anson Provides copious notes on the origins of each of their products paying tribute to the grain’s history and heritage with a detailed write up on its evolution as a foodstuff and some finer notes on what makes certain varietals of a grain uniquely disposed to a specific type of milling and/or culinary use. 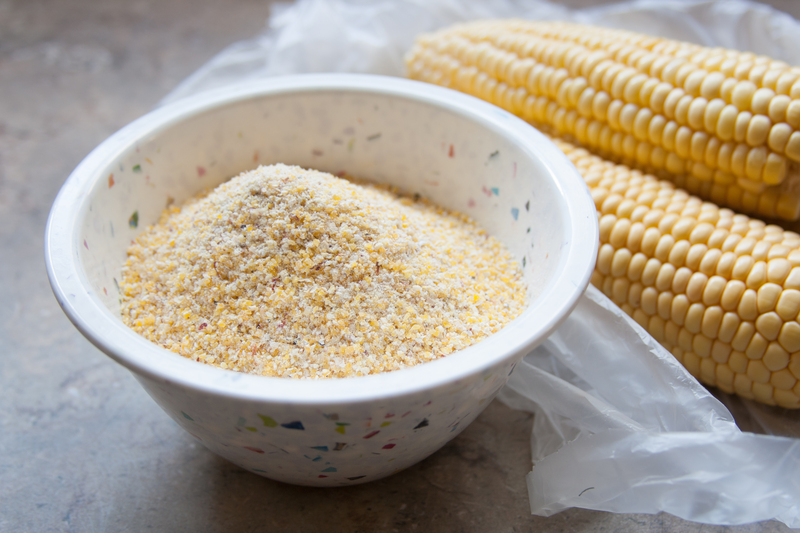 I found the write up on corn incredibly fascinating, in addition to delving into the division between flint and dent corn, the author works to provide some fine tuned background on what makes cornmeal, polenta, and corn flour unique; a question I, myself, had wondered for quite some time. And while all of this is immensely inspiring, the grains themselves feel almost too special to put to work. And so, dear readers, my satchels of perfectly milled flatbread flour, rye, farro, and grits have sat gathering the freezer equivalent of dust while I have fiddled about looking for the right recipes to showcase these meticulously ground gems. 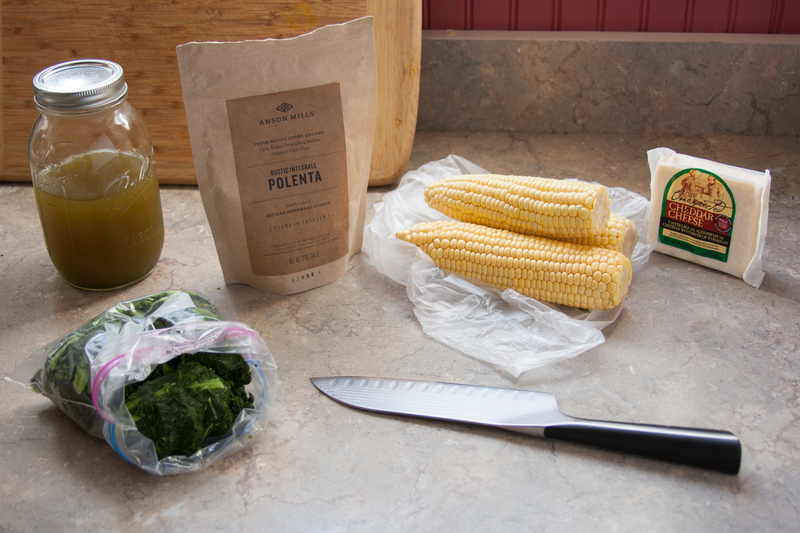 Armed with what I hoped would be a great recipe to show off the proud textures of Anson Mills’ polenta I set off to the freezer to pluck out a bag of their Polenta Integrale. At the same time I “unearthed” a bag of frozen kale that I knew was hiding about the bottom of the freezer and set about making dinner. This dish was inspired by a recipe from “Whole Grains for a New Generation” by Liana Krissoff, which has become an indespensible reference for grain cooking techniques and ideas (during a recent purge of old cookbooks for a yardsale, and subsequently, sale on Amazon, I knew this was one book that I simply cound not part with.) While Liana’s recipe is lovely I, as usual, was itching to play with the quantities of the ingredients called for, adding more kale, tossing in some frozen corn, reducing the amount of cheese etc… When making this recipe we tested two different techniques for baking the “crust.” Both methods were delicious though they turned out quite different looking end products. For the first crust we allowed the polenta to cool in the pan for only a short time (5-10 minutes) before releasing the springform. The polenta, which was not yet fully set, poured out into an organic pie shape. Though it could not be flipped to allow the underside to cook as well, we tossed on the toppings, popped it in the oven and pulled out a lovely freeform pie not long thereafter. With the second crust, we poured the crust and baked through the first baking and then allowed it to cool before popping it in the refrigerator overnight for use the next day. This crust was far easier to work with as it had fully set and the polenta was well jelled. Feel free to toy with the amount of time you rest the crust, the fact that it can be so easily poured and par-baked in advance makes it a great make ahead recipe for those with little time in the evenings to get dinner from chopping board to table. Preheat the oven to 425 degreese. Wash the greens REALLY well, I typically run this procedure in a salad spinner by filling the spinner with water and dunking the greens in and out of the water, if the water starts to look murky dump it and refill it. 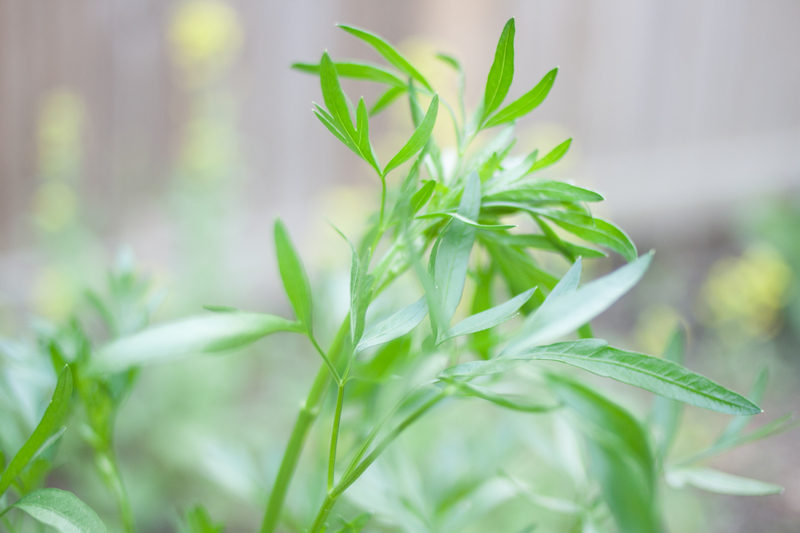 (You can “dump” the water in your garden or use it to water house plants!) Kale, especially the curly-leaf varieties has a way of clinging onto little pockets of dirt so as you go about washing the leaves, make sure to agitate the greens with your hands to loosen any dirt clumps that my be hiding in the curls. Drain the leaves but don’t dry them. Prepare a large ice bath and set it next to the stove (if possible.) Place the greens in a large pot over high heat. Cook, covered, with just the water clinging to leaves, tossing occasionally with rubberized tongs, until wilted, about 4 to 6 minutes. When the greens are just done cooking transition them immediately to your prepared ice bath to shock them – the shocking process will not only stop the cooking process but will brighten the greens color and prevent the greens from looking stodgy and muted. Once the greens have thoroughly cooled in the ice bath dump them into a large colander. 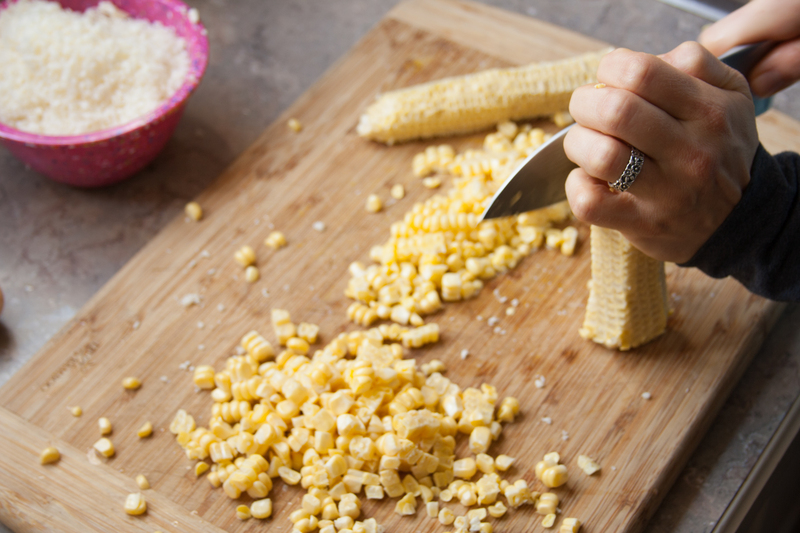 Grab a fist sized bunch and squeeze it between your palms to extract as much water as possible. 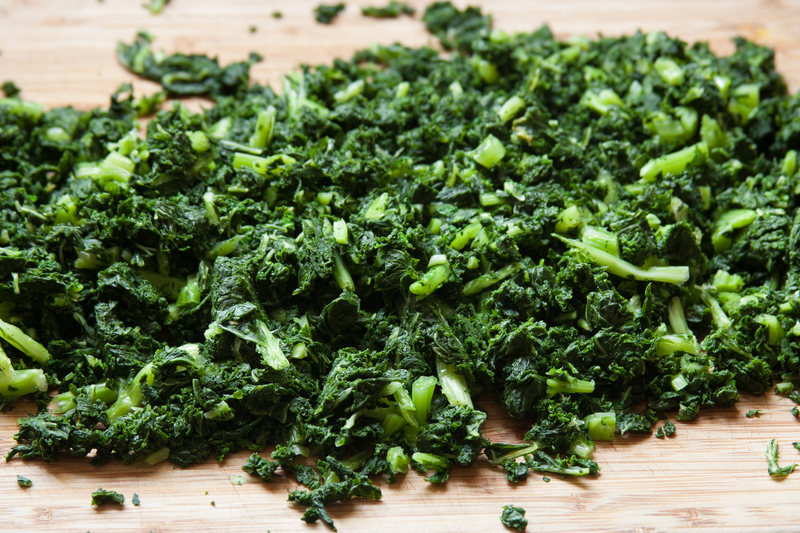 Place the well drained balls of greens on a cutting board and chop them coarsely. In a medium saucepan, bring the 4 Cups of water to a boil over high heat. 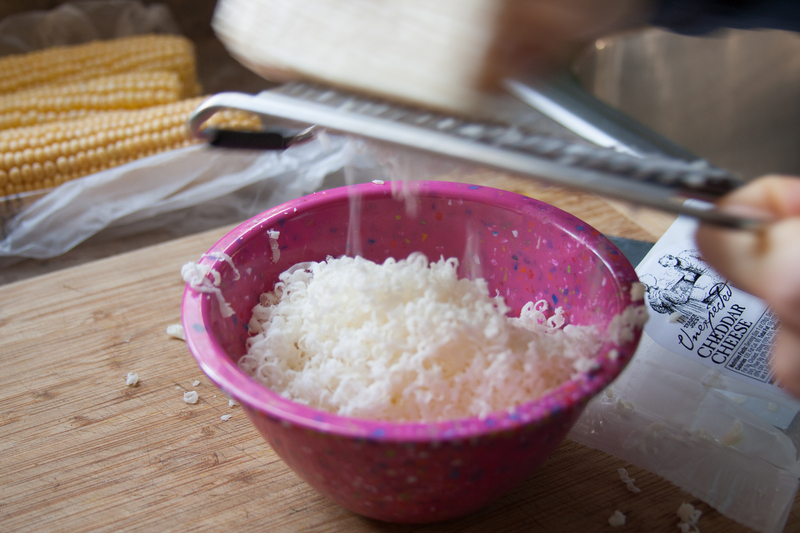 As soon as bubbles break the surface, add the salt and corn kernels. Once the water is boiling again, add the polenta in a stead stream, stirring constantly. 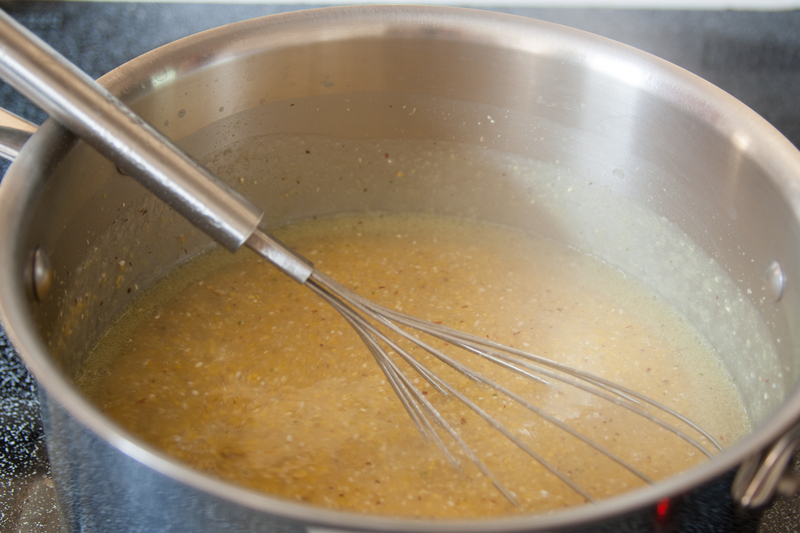 Reduce the heat to low and allow the polenta to simmer, stirring frequently, until thickened. Pour the polenta into the prepared baking pan and pop it into the oven to bake for about 25 minutes. 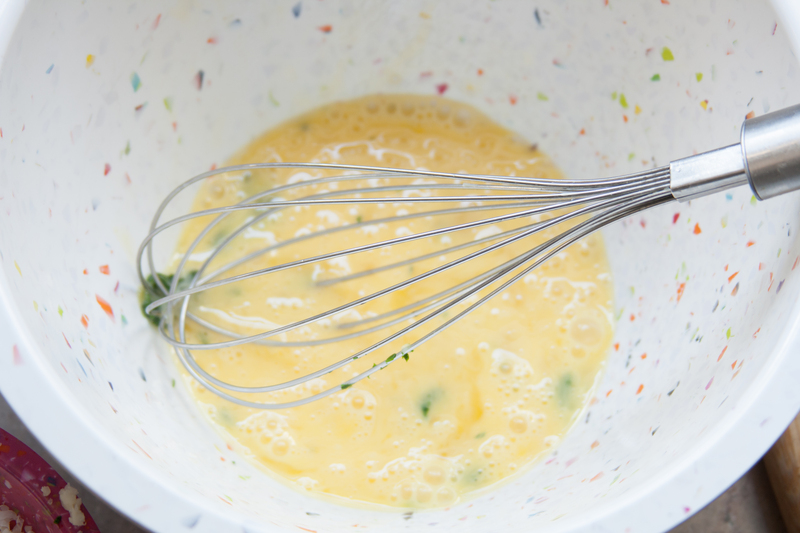 While the polenta is baking whisk the eggs together in a medium sized mixing bowl. Add the greens, a few hearty cracks of pepper, and the cheese. Mix well and then cover with plastic and pop it in the fridge until it is needed. Once the 25 minutes have elapsed, remove the polenta and place it on a metal rack to cool for at least 30 minutes. OK – now for the tricky part. Pop open the hinge on your springform pan. Depending on how well set the polenta is, it may ooze out a bit. This is A-OK, step back and let it do its thing, this is why we lined the spring form with a long piece of parchment. 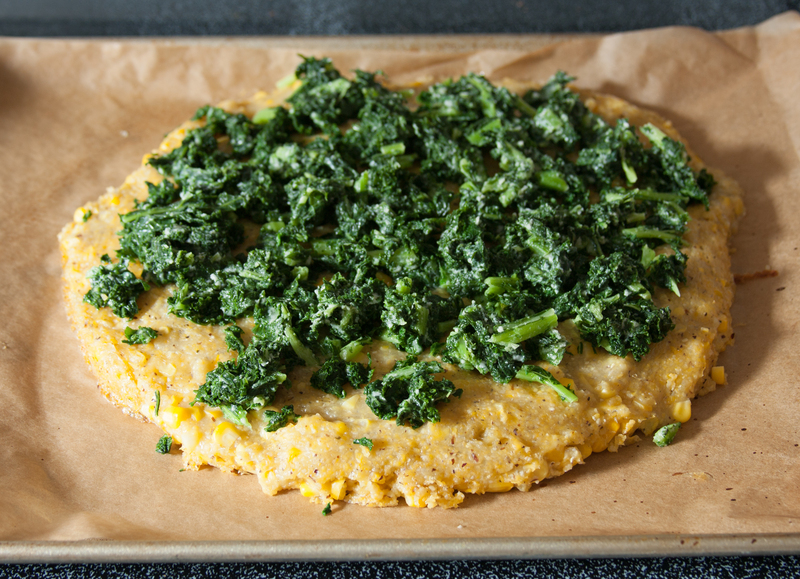 Take a second piece of parchment and place it on top of the polenta circle. On top of this place a cookie sheet clamp the sheet down tightly atop the baking tray. Now, carefully, and in one smooth motion, flip the entire unit over. Remove the baking tray, the bottom of the springform pan, and the parchment. 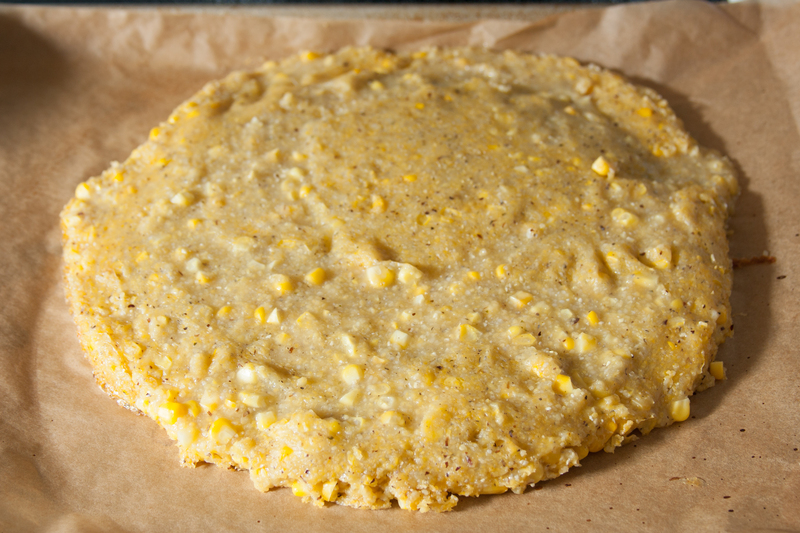 Your polenta wheel should now be sitting pretty on a cookie sheet with what was formerly the bottom now facing up. Place the cookie sheet in the oven for 15 mins to begin to cook the top. 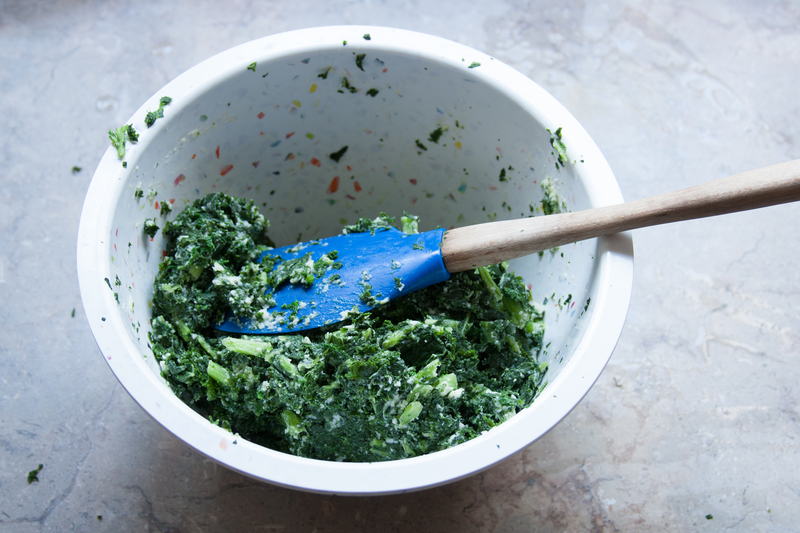 Remove the pan and scatter the kale topping over the base. Return the tart to the oven and bake for another 25 mins or so. I like the kale topping well crisped but take care that it doesn’t burn. In our home, eating nourishing and sustainable foods is just one part of our quest to maintain a healthy and balanced lifestyle. 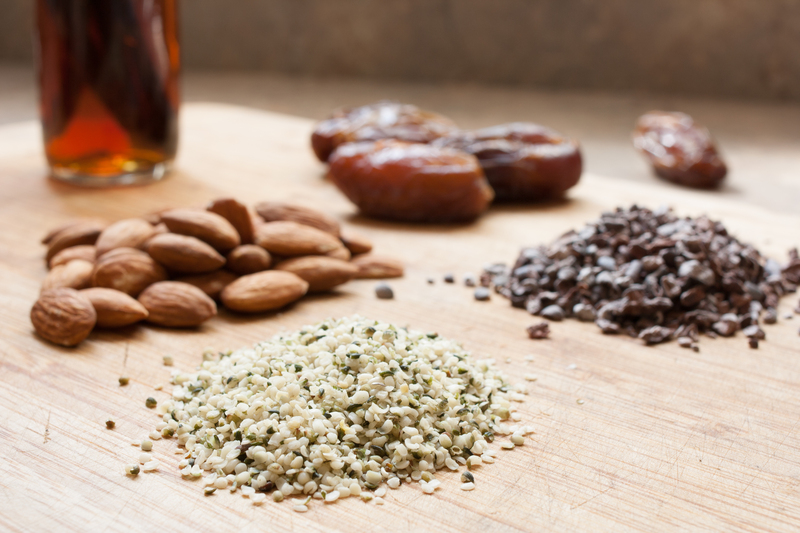 Dustin and I have shifted towards using minimally processed ingredients not only because of their rapport but because these foods help fuel our active lifestyle. We both typically engage in some sort of exercise every day. While our fitness obsessions have varied over time, from climbing, to yoga, to cycling, running, soccer and HIIT training, this vast cornucopia of exercises all have one thing in common. Each sport or hobby we take on requires that we power our bodies with clean burning fuel. Back in our climbing days Dustin and I munched on countless cliff bars and downed an endless flow of vitamin water. But these bars and sports drinks, while not exactly abysmal, are far from clean and healthy. Vitamin water in particular is packed with processed sugars, artificial dyes, and chemically engineered flavoring. Clif bars were fine, at the time, for providing an immediate source of fuel to push us through laps at the gym, but with most varieties clocking almost 25g of sugar mostly from the primary ingredient, brown rice syrup (which, as an ingredient, boasts virtually no nutritional merit) these aren’t exactly a healthy option for most athletes. There is a place for consuming quickly digestible sugars and other carbs in endurance heavy events, where you might be working out for multiple hours and might deplete your glycogen stores if you do not refuel. 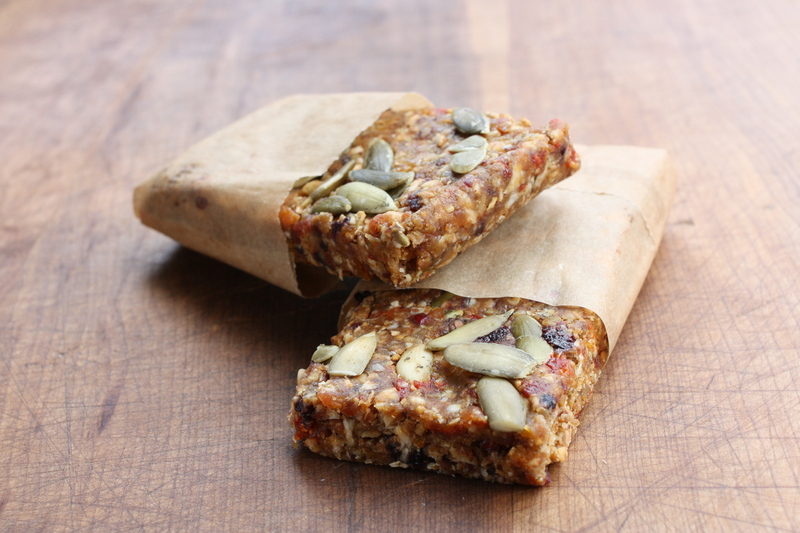 These bars could be used in this way – although, with about 7 grams of fiber in each bar you probably would not want to eat too many of them on a very long run. We’ve been using them as a pre-run fuel (taking advantage of the natural fruit sugars and complex grain carbs) or as a post-workout recovery snack (utilizing the 11 grams of protein from the nuts, seeds and protein powder). What initially caught my eye in this post’s featured recipe was the lack of added sugar. 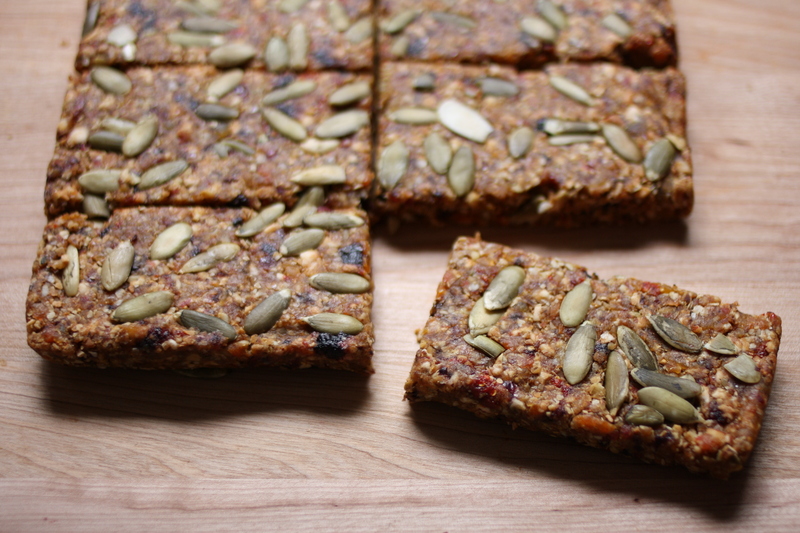 Typically, granola bars or power bars contain a boatload of honey, maple, or molasses to sweeten and bind. Not so here! Also exciting to me was the fact that you don’t need to bake them. You may have a moment of doubt as you peer into the food processor wondering how on earth these things are ever going to stick together. But persevere – once the juice is added at the end the mix should start to resemble a piecrust dough, crumbly but clumpy at the same time. Like with a piecrust, go easy on the juice, adding a little at a time until you sense that the mixture will just bind when pressed into the pan. As with pastry, finding the right balance may take a batch or two to master. I adapted the original recipe a bit to include some protein powder. I used an unflavored rice-based protein, which, I suspect, may have aided in the binding process. While I am fairly certain that any type of protein powder could be used here, it may alter the texture a bit. I am picky when it comes to buying dried fruit. I strongly prefer to buy organic as dried fruit are truly just shriveled versions of whole fruit and can carry with them the same residues from conventional growing practices, only in increased concentration. Trader Joe’s typically has an excellent selection of dried fruit and I find that their prices are far lower than large box stores. I really like the R.W. Knudsen Family line of juices. I used their black cherry juice in this recipe. 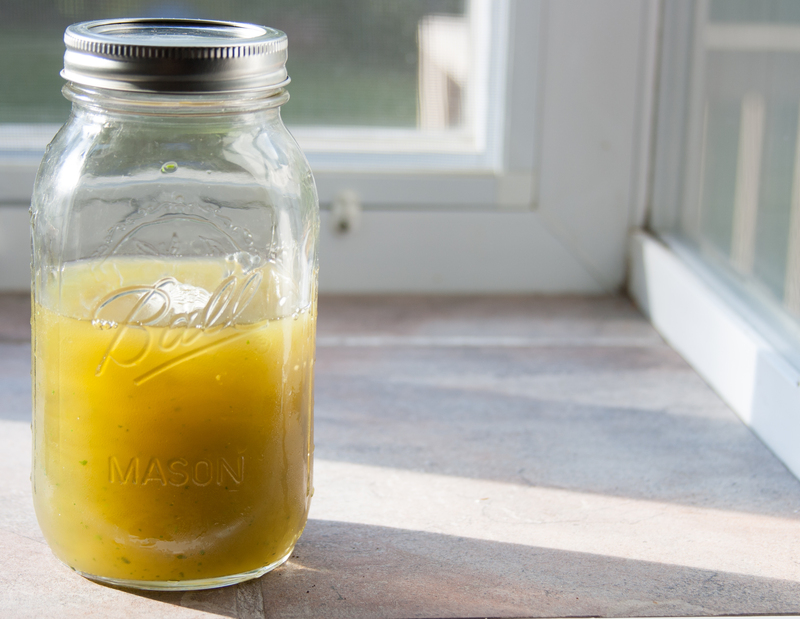 It is a simple juice made from only one ingredient! I imagine that any of their single fruit juices would work well in its stead. The black cherry is the only one I have found in small, 8oz, servings. 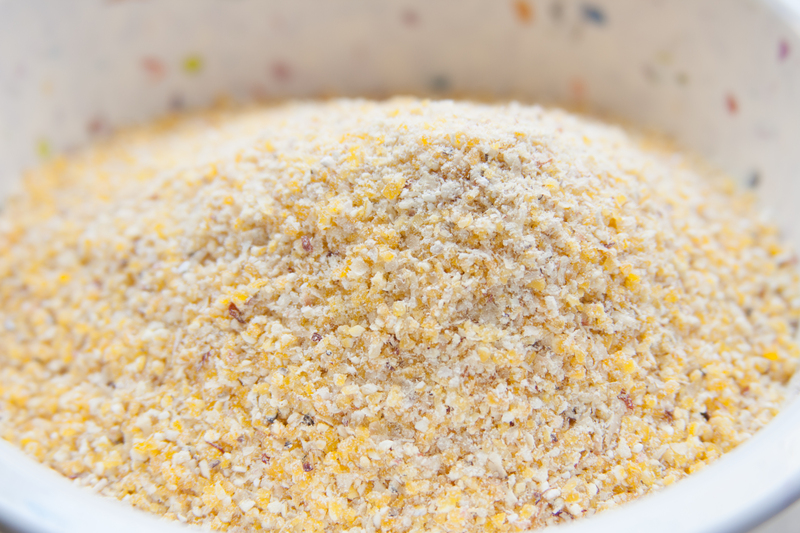 If you have never come across quinoa flakes before, they are quite similar to rolled oats. I am fairly certain that oats could be successfully substituted but if you can find the quinoa flakes they are worth a try as they are much higher in protein content than oats and are likely a bit easier/faster to digest. 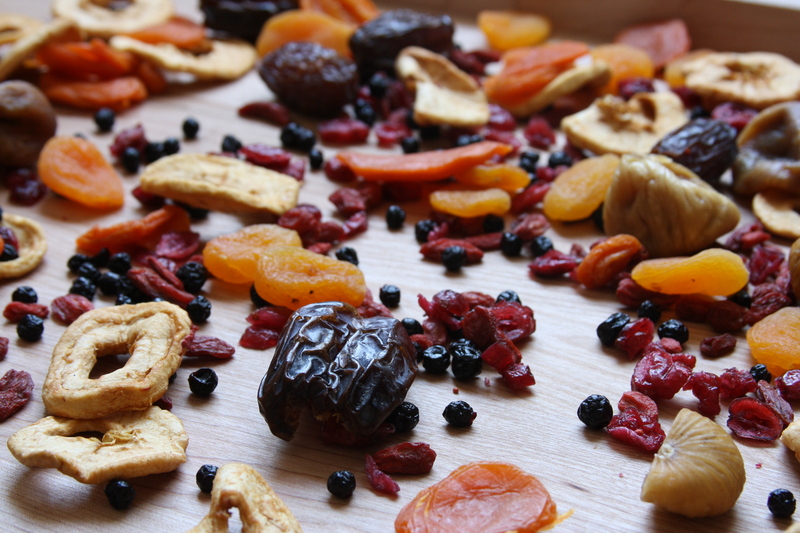 The amounts of the various dried fruits can be toyed with and adjusted to suit your specific preference. 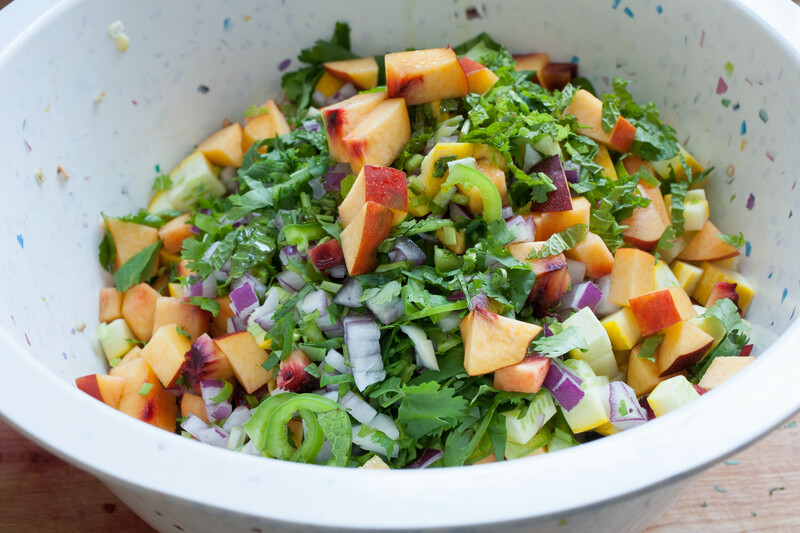 I used what I had on hand and I ended up really liking the balance of fruit in the end-product, but I imagine that there are many other dried fruits, from mangos, to figs, to dates, that would work well. Just as in other aspects of your diet, picking a variety of fruits from various different families (i.e. berries, stone fruit, pomes etc…) will provide, not only a well balanced flavor profile, but a broader nutritional profile as well. Line a 7 × 11 inch baking pan with parchment paper (no need to grease or spray the pan.) Paper should hang over the sides; you will later use this overhang as “handles” to remove the bars from the pan. 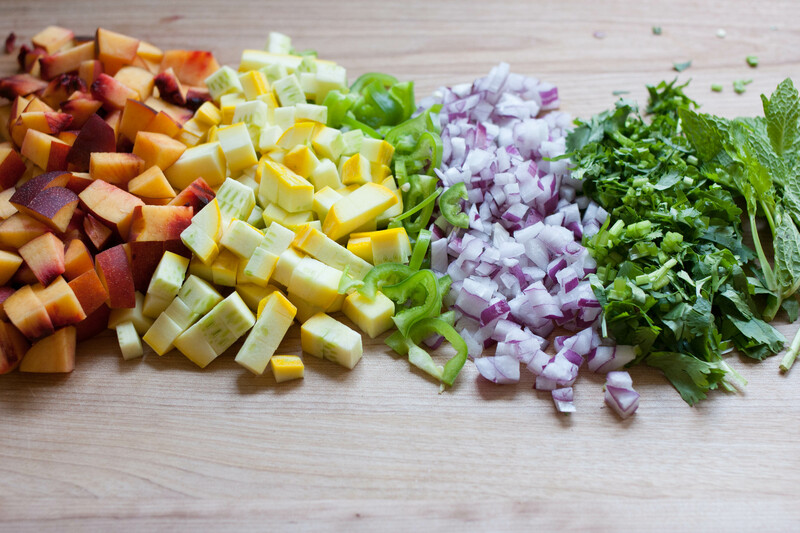 Set the pan aside. Preheat the oven to 350°F. 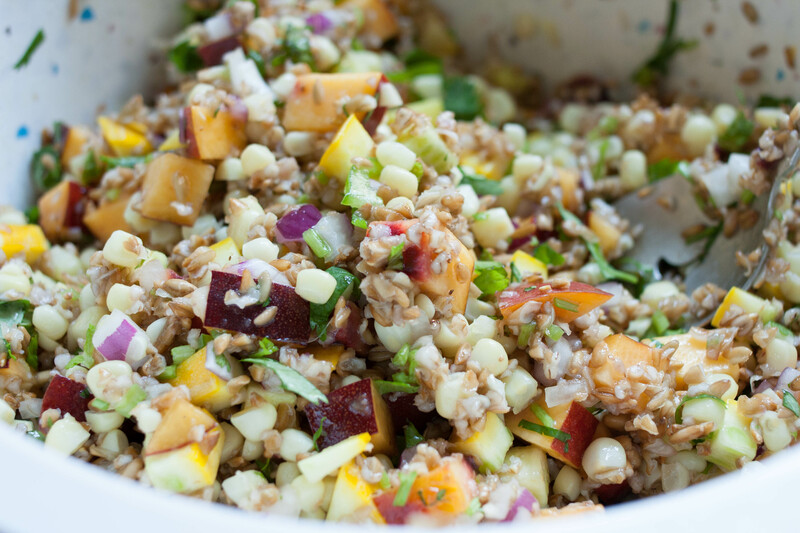 Place quinoa flakes, chopped almonds, and coconut on a large, rimmed baking tray and toast in the oven until just golden and fragrant. You may need to stir the mixture once or twice in order to ensure reasonably even toasting. 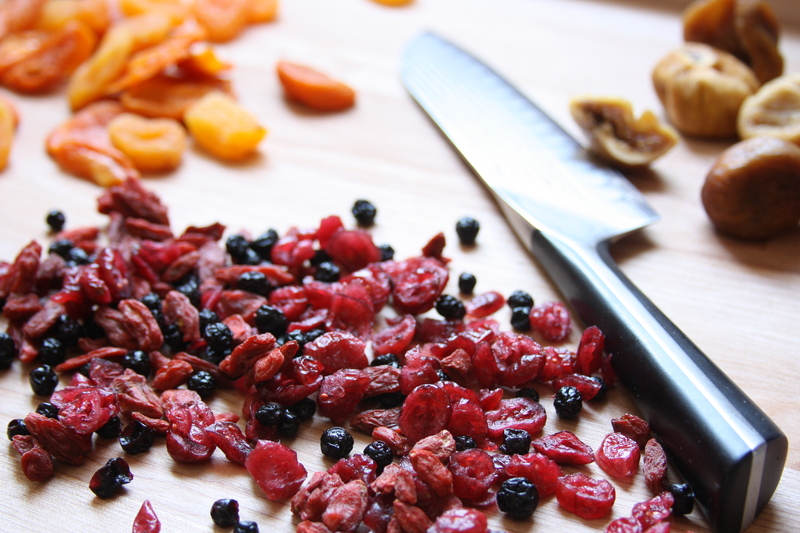 Roughly chop all of the dried fruit and then pulse once or twice in batches in the food processor until minced. Make sure you stop well short of turning it into a fruit paste! 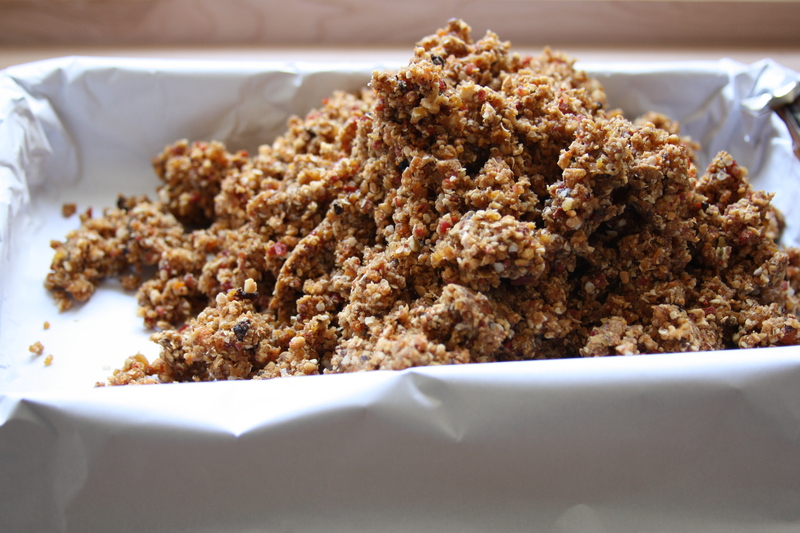 Place the cooled quinoa flakes, almonds, and coconut in the processor and pulse briefly until it becomes a coarse meal. Add the protein powder to the bowl of minced fruit pieced and toss them together with your hands to distribute the powder and “unstick” some of the fruit clumps. 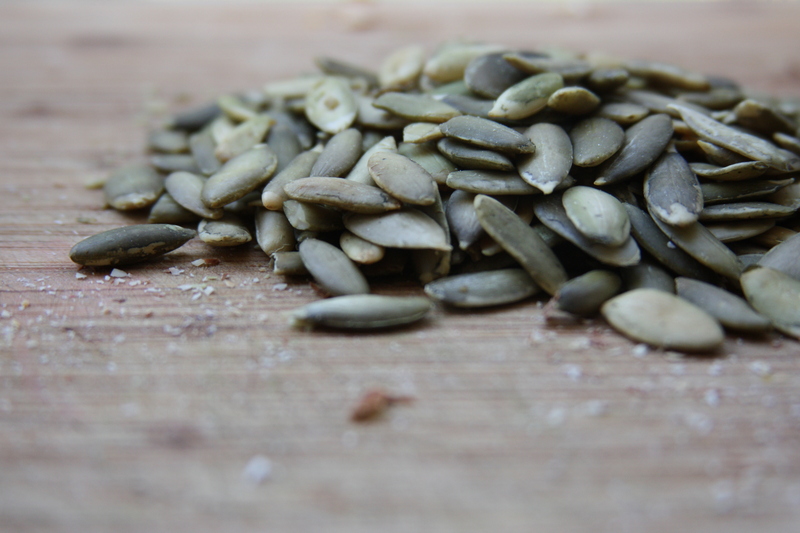 Add this to the food processor along with half of the pepitas and pulse once or twice to combine with the nut/quinoa meal. Drizzle over about half of the juice and pulse once or twice, continue adding the juice in TBSP increments, pulsing in-between until the mixture just starts to come together. 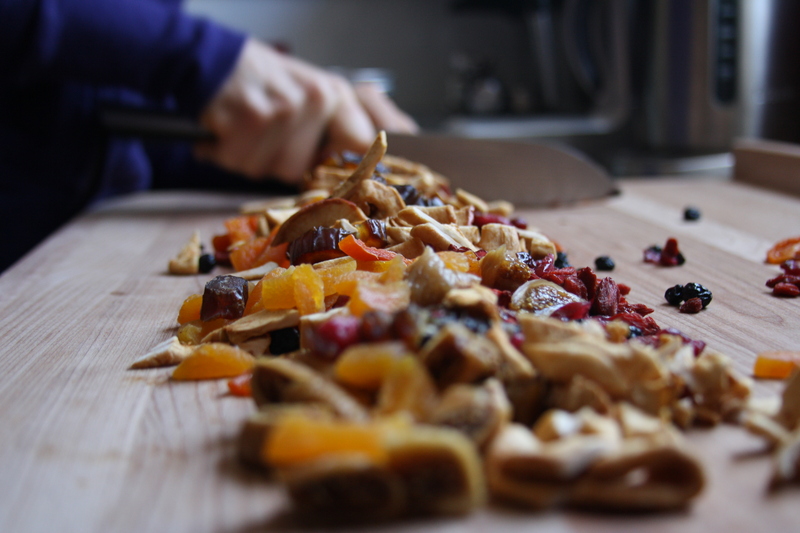 When the mix is ready it should still contain discernable pieces of fruit and nuts and hold together if pinched between thumb and forefinger. Cover the mixture tightly with plastic wrap and place in the refrigerator overnight to allow the bars to solidify. 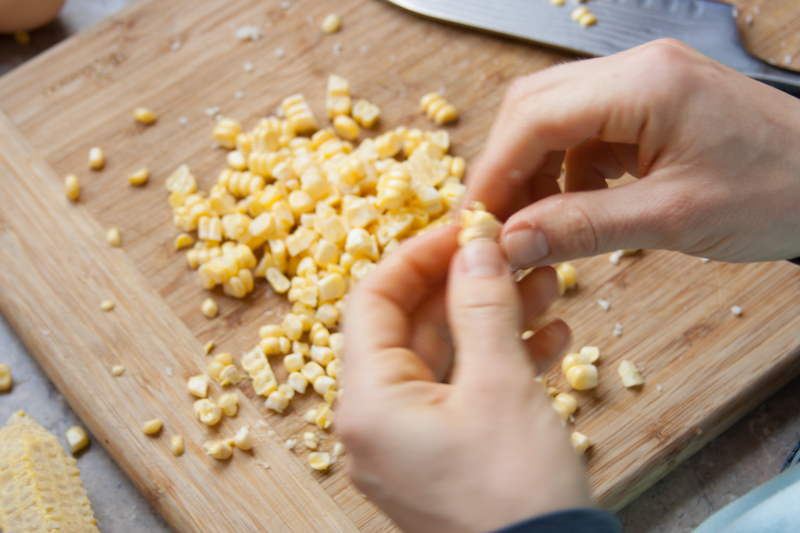 The next morning, lift the sides of the parchment to remove the bars and place on a cutting board. Using a sharp knife and a smooth vertical cutting motion (no sawing!) cut the bars into 12 even pieces. These keep well for a week or two in a tightly sealed Tupperware container in the fridge. Engineering Report: Precision Single Serving Coffee Brewing Techniques. Engineering Report: People are sleepy. We must wake them up, not only with a kick of caffeine, but with the robust aromas of a well crafted cup of freshly brewed coffee. This is Dustin writing and I’ll be sharing a little about my ever growing excitement with drinking coffee and my interest in finding the best methods with which to tap into those flavor filled little beans. 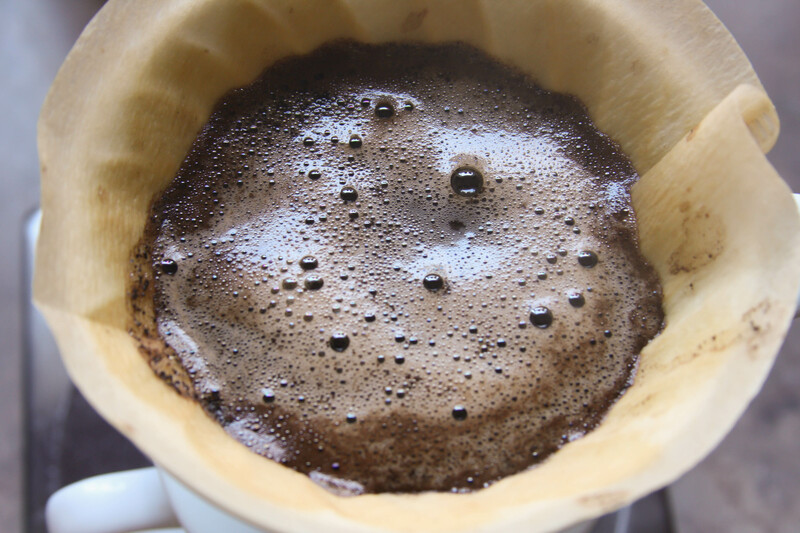 Today we’ll explore pour over coffee making. I first started drinking coffee in high school, when I worked at St. Louis Bread Company, bussing tables and taking orders. The coffee was free, I knew when it was made – as that was one of my main jobs – and it was a good excuse to consume some of the honey that was available at the coffee condiments station. Those days it was a tall cup of honey-sweetened hazelnut flavored coffee that accompanied my weeknight shifts at the bread haven. Some 10 years later, I find myself still enjoying a hot cup of coffee every morning and even some early afternoons, but these days there is no honey or hazelnut to hide the flavors of the coffee. Coffee, along with many other aspects of my life, has taken on a quality over quantity focus. Emily and I find ourselves with the opportunity to delve into yet another adventure of exploration, as we are beginning to learn more about the origin and character of the coffees we drink as well as the methods in which we prepare this popular beverage. Our daily coffee rituals have shifted over the last year as we have become more interested in finding out what exactly we like about the coffee we are drinking and what brewing method might yield the best results. What started years ago with a Mr. Coffee machine from the dollar store transitioned into a traditional drip coffee machine, then french press and most recently individual pour over cups of coffee. As with our cooking, choosing quality ingredients has become a main focus in our coffee making life as well. That is another reason that coffee is an exciting culinary ingredient to explore – because it is becoming more easy to find single origin coffees from all over the world. Comparing coffees of different varietals or from various countries is exciting. This brewing method (and others) allows you to really taste the bright acidity of some lighter roasted coffees or the chocolate, berry or even burnt caramel flavors of some of the darker roasts. Like with small batch bourbons here in Tennessee and our neighboring State, Kentucky, single origin coffees offer multiple layers of aroma and taste to explore in each newly brewed cup. Coffee blends, which include beans from multiple farms or regions and potentially different varietals, are also an essential piece of the puzzle, especially for regular drinking. We tend to have a few rotating weekday coffee blends, while saving some of the single origin coffees to explore on weekend mornings when we have more time to savor. Coffee blends can be more balanced – and less expensive – than single origin coffees, but can still maintain the fruity/citrusy/chocolatey flavor profile of the various farms’ beans added to the mix. It is exciting exploring the different flavor profiles of each coffee varietal, the different regions where they are grown, and the different processes in which the fruit is harvested and then roasted. The Blue Bottle Craft of Coffee has served as a great resource for our recent endeavor into precision coffee brewing and is likely one reason we’ve gotten so revved up about coffee exploration. 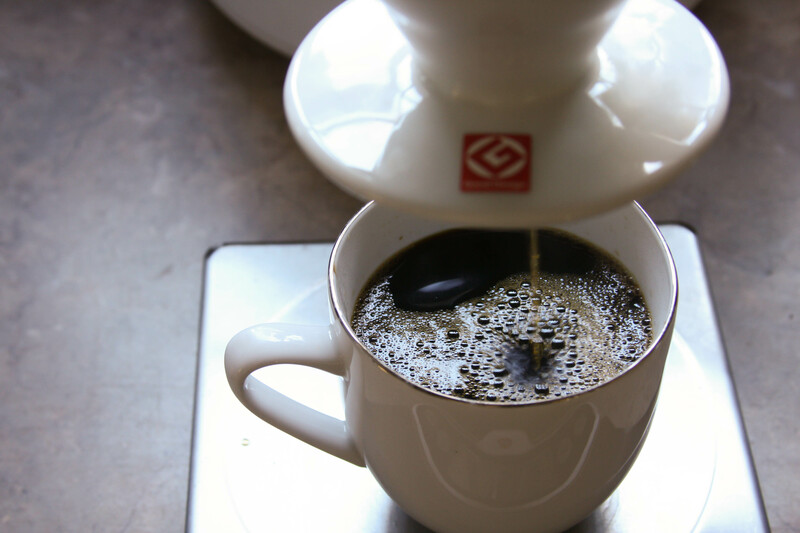 Brewing coffee with the pour-over method has been a quick, direct way to tap those flavors of small farm and good quality beans, and one that we wanted to share for those out there that might like to delve a little deeper into their daily cup of joe. Add just boiled water to your coffee mug to bring it up to temperature. Grind your beans to a medium grit, somewhere between the coarse grind for french press and a very fine grind such as for espresso. Insert the dry #4 filter into the ceramic dripper and measure out about 30 grams of grinds. Depending on how strong you like your coffee and how large your java vessel is, you might add more or less grinds. As a starting place, add 1 gram of coffee for every 10 milliliters of water. If you haven’t worked in metric in the kitchen, definitely try it out. I am always blown away by the system’s intuitive nature. How much does 1 milliliter of water weigh, you might ask? How about 1 gram! How many grams in a kilogram? 1,000! How many ounces in a cup or in a pound? 8, 16? Yeah, not so intuitive. Maybe someday we in America will embrace more of the metric side of life – but I digress. 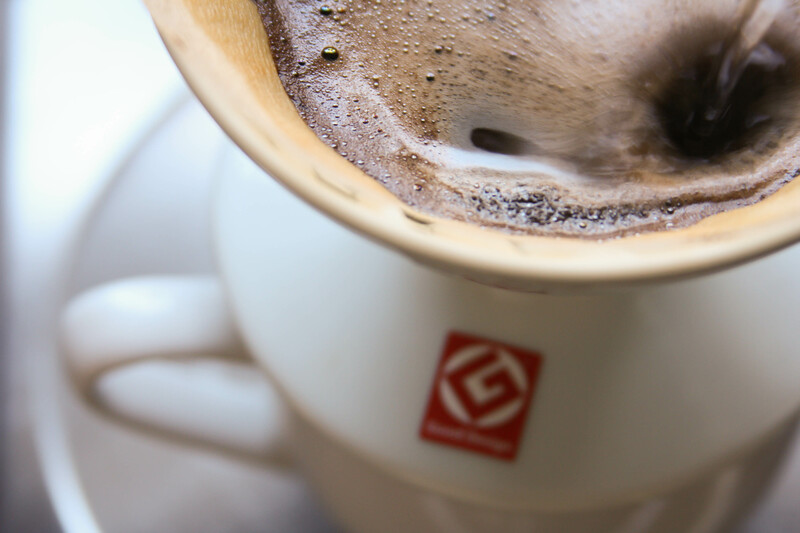 Add your coffee to your filter, letting it mound naturally. Do not pack the grinds, as we want the water to evenly infuse all of the ground little bits of beans. The next step is to add the recently boiled water, which should be approximately 185-205 degrees for optimum flavor extraction. Use a swan neck kettle if you have one, or alternatively you can try your hand with some vessel that will allow you to pour water very slowly and precisely. Slowly add water, you are aiming for an amount that is double the weight of the coffee grinds. Pour steadily but with control as you add this first bit of water, starting in the center of the mound and working your way to the edges in a circular pattern. With practice, you will be able to add double the weight of water to the grinds without letting any of the water drip through into your cup. Now let the grinds bloom for about 45 seconds. Blooming is integral to the process as it allows the grinds time to become fully saturated with water. After blooming, slowly add more water, watching as the tan foamy cap rises just above the grinds. Continue to add water at approximately the rate at which it is dripping through, keeping an eye on the level of coffee in the cup as you go. Make sure that you have enough hot water on hand at the beginning, so that you don’t have to halt the process mid brew. Once you have finished your cup, take in the variety of flavors and aromas that you have unleashed from the beans and enjoy! As a side note, coffee grinds make great additions to a compost pile, so don’t throw them away!